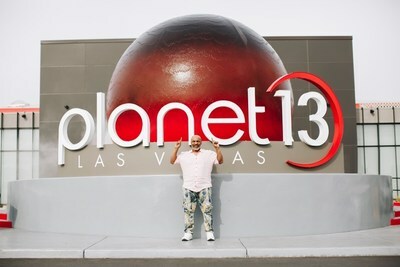 LAS VEGAS, March 14, 2019 /CNW/ - Planet 13 Holdings Inc. (CSE: PLTH) (OTCQB: PLNHF) ("Planet 13" or the "Company"), a leading vertically-integrated Nevada cannabis company, announced today that it has signed a Purchase Agreement (the "Agreement") with Mike Tyson's cannabis venture, Tyson Ranch ("TR"), to be the exclusive launch partner of Tyson Ranch products in Nevada. The Agreement also includes marketing appearances by 'Iron Mike' at the Planet 13 Cannabis Entertainment Complex (the "SuperStore"). Tyson Ranch products will be available on Superstore shelves on April 13th with Mike Tyson attending the launch, offering autographs, pictures, and raffling memorabilia and prizes for Planet 13 customers. "With thousands of consumers and cannabis aficionados from all over the world coming through our doors every single day the Planet 13 Cannabis Entertainment Complex offers brand companies a unique venue to launch their brands and rapidly build a national and global reputation. We are honored that Mr. Tyson has chosen the Planet 13 SuperStore for the Nevada launch of Tyson Ranch and appreciate the opportunity to be the exclusive launch partner for this widely anticipated brand, in Nevada," said Bob Groesbeck, Co-CEO of Planet 13. "With our Phase II expansion underway, we expect the SuperStore's national and global reputation to continue to accelerate making Planet 13 the perfect place to build a nationwide brand." Mike Tyson, the founder of Tyson Ranch, added. "Tyson Ranch is all about going the extra step to offer truly great cannabis. The Planet 13 Cannabis Entertainment Complex offers customers an ultra-premium cannabis experience that dovetails perfectly with Tyson Ranch's belief that not all cannabis is created equal." This news release contains "forward-looking information" and "forward-looking statements" (collectively, "forward-looking statements") within the meaning of the applicable Canadian securities legislation. All statements, other than statements of historical fact, are forward-looking statements and are based on expectations, estimates and projections as at the date of this news release. Any statement that involves discussions with respect to predictions, expectations, beliefs, plans, projections, objectives, assumptions, future events or performance (often but not always using phrases such as "expects", or "does not expect", "is expected", "anticipates" or "does not anticipate", "plans", "budget", "scheduled", "forecasts", "estimates", "believes" or "intends" or variations of such words and phrases or stating that certain actions, events or results "may" or "could", "would", "might" or "will" be taken to occur or be achieved) are not statements of historical fact and may be forward-looking statements. In this news release, forward looking statements relate to, among other things, future expansion plans. The Company is indirectly involved in the manufacture, possession, use, sale and distribution of cannabis in the recreational and medicinal cannabis marketplace in the United States through its subsidiary MMDC. Local state laws where MMDC operates permit such activities however, these activities are currently illegal under United States federal law. Additional information regarding this and other risks and uncertainties relating to the Company's business are contained under the heading "Risk Factors" in the Company's annual information form dated October 18, 2018 filed on its issuer profile on SEDAR at www.sedar.com.